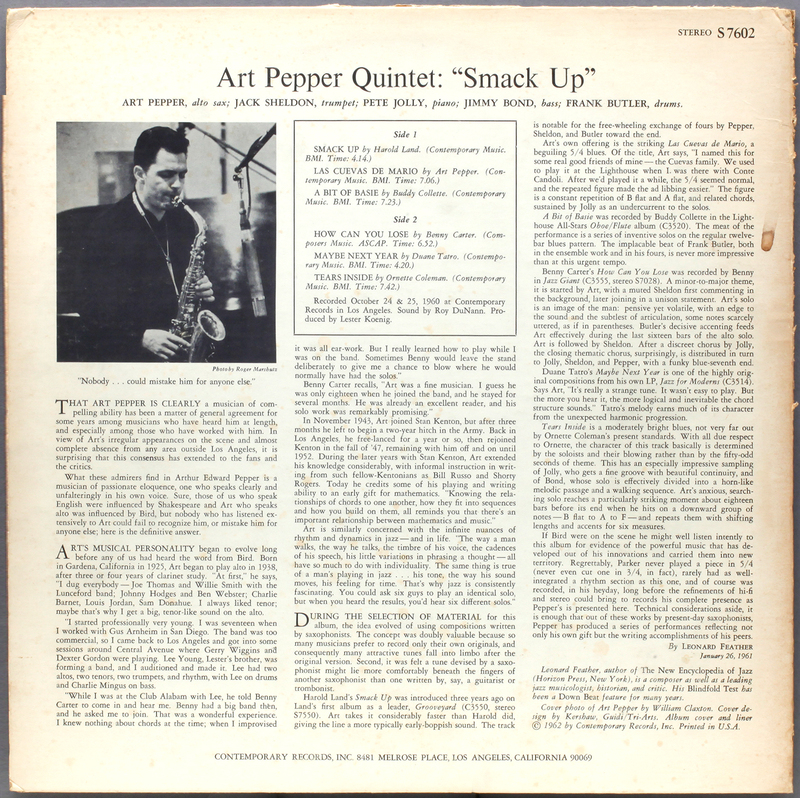 Smack Up differs from the usual West Coast formula, of standards and show tunes, in featuring songs composed by other saxophonists, from the famous (Benny Carter’s How Can You Lose?) to the infamous (Ornette Coleman’s Tears Inside) , and the deserving-of-wider-recognition Harold Land for the title track Smack Up. 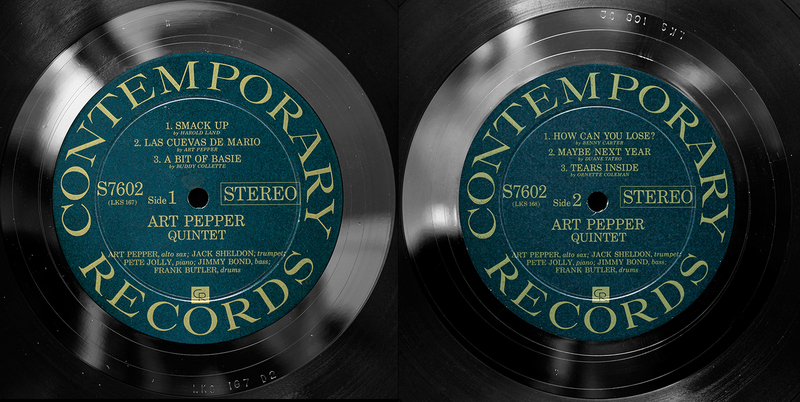 The resulting variety of styles gives the album greater breadth than Pepper’s other records, or indeed most West Coast records.The playing is terrific, with energy and swing in equal measure, and is one of the highlights of Pepper’s recording career. Having already recorded one of the all time great jazz albums in 1957’s “Art Pepper Meets the Rhythm Section” up there with Kind of Blue in my opinion, Art adds must-have Smack Up to the austerity-burdened record collector’s must have list. “Smack” was of course the street-name for heroin. Shortly after recording “Smack Up” Pepper was sentenced to three years jail for heroin possession, treating his addiction as a social problem not a medical problem. In effect, Art got three years unpaid rehearsal time.Today we have a more sensible approach: we try to put his dealer behind bars, pushing up the street price and further enriching the ruthless Mexican cartels in the supply chain. In place of a War on Drugs, the US tried a War on Musicians. It made a sort of sense from their point of view: at least musicians didn’t generally shoot back. Cover alert! Technical hitch in the printing department, the cover art has been printed or trimmed 5cm too small for the jacket. Whoops, bodge-it! Every expense spared, no lamination, lamb dressed up as mutton, frankly the reissuers did a better job. The thing is, forgive the cover, the stereo is marvelous, huge soundstage, a joy to listen too, and that is coming from a mono-fan. Roy DuNann got it right at a time when many didn’t. If you see a green/gold or black/gold edition of either Contemporary or “Stereo Records” – DuNann’s original venture – grab it with both hands and shriek “its mine, its mine!” and don’t let go until the men in white coats arrive. This stereo release came after Contemporary began releasing stereo in their own name, so it is, I believe, the first press, however no doubt the mailbox will be jammed with corrections if not. I’m not going to argue that the sleeve “looks fine” because, in truth, it looks awful. A bit like the seller who described my recent record purchase with three deep inch-long scratches as “VG Plus, some light marks which not affect play“. The 5cm gap of bare cardboard on two edges does not affect looking, true. A distinction I have made before, Collectors prize the cover, Audiophiles prize the vinyl. Nice to have both but sometimes it’s not an option on the table. 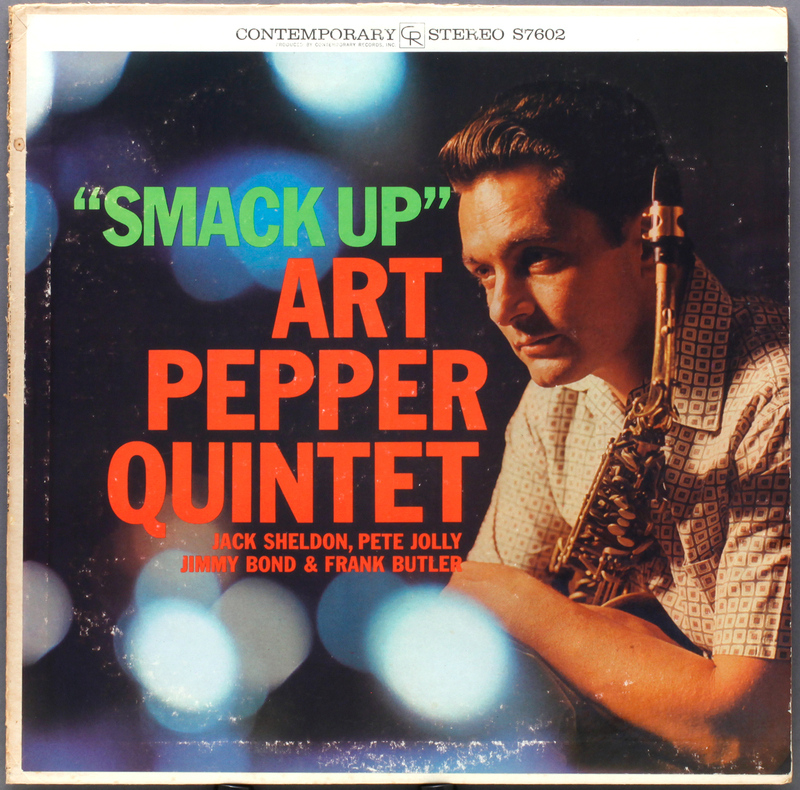 This entry was posted in Art Pepper, Contemporary, West Coast and tagged Art Pepper, Contemporary, Frank Butler, Jack Sheldon, Jimmy Bond, Pete Jolly, Stereo by LondonJazzCollector. Bookmark the permalink. Hi Great Record this one and so it happens I have the same record in a slight variation…..the label is BLACK DG and the back cover has some additional stereo info on the upper part. So which is first?? I have never found any convincing explanation why and when Green and Black, other than people say the green is “later”, based on…who knows. My Goldmine doesn’t acknowledge the variation. A mystery for sure. I forgot to mention that the cover front is also glued on like your LP but mine is definately what most people call semi-laminated. Is yours? If there had been a sticker on it, it is the sort of finish you would probably decide better to leave alone, in case it lifted the paper with it. No gloss or lamination, just fairly thin art paper print with a light sheen which I assume is its natural condition. I would say that mine is definately glossy in a semi-laminatet form. Worth to note is that my cover is NM. Maybe some of the shine wears off?? If yours is semi-gloss, then there is something not right about my cover – it is hard to believe such a poor a construction would make it past quality control to the record store. It has to be a manufacturing reject, sample test print, anything except normal commercial retail cover. I guess I’ll never know. Really wonderful blog, by the way. Nice try Martin. I pulled another US Contemporary original off the shelf, C3526 Curtis Counce Group (1957) cover “Printed in USA”, and it follows the familiar pattern of cover art folding over on three sides, and undersized liner notes pasted flat on the back, on top. This Pepper (1960) seems to be made the other way around. Its either a very novel way of saving a cent on ink, not out of the question, or someone ordered the cover art and liner notes with the dimensions inadvertantly swapped over, or the someone guillotined something wrong at the printers and its a salvage batch. Whatever the explanation, its great music inside, which is what matters. I think the cover defect is due to original (sic) inaccurate glueing pic on cardboard. I’ve one Contemporary Pepper, M 3568, +eleven, with the left front edge where cardboard can be easily seen, about 1/8 inch. this small stripe is a little bit dirty due to moving the record in and out the shelf. and is more fragile too.